On April 15, 2019, at the County Planning Division's Annual Business Meeting, conducted at the APA National Conference in San Francisco, the County Planning Division in conjunction with the National Association of County Planners will present their 2019 Project Awards. This year one Award of Excellence will be presented. An Award of Excellence to Chester County, Pennsylvania, in the Comprehensive Plan — Large Jurisdiction category for the Landscapes3. Landscapes3, Chester County's newly adopted comprehensive plan, seeks to balance preservation and growth across the county's landscapes in six goal areas: Preserve, Protect, Appreciate, Live, Prosper, and Connect. Landscapes3 recommits the county to core planning principles of resource preservation, revitalized urban and suburban centers, housing diversity, transportation choices, collaboration, and resiliency. The plan establishes a vision for the county and its municipalities and provides a framework for collaboration across municipal boundaries. The Chester County Planning Commission began the update of its 2009 comprehensive plan, Landscapes2, in late 2016 with the goal of having a new comprehensive plan completed and adopted within the 10-year timeframe required by the Pennsylvania Municipalities Planning Code. Landscapes3 represents a renewal of the county's longtime commitment to balancing growth and preservation while addressing current planning issues that were of minimal concern a decade ago. The plan update built on the solid foundation of the previous two "Landscapes" plans, while bringing something new and innovative to the planning process. A top priority in the update process was to engage with as many stakeholders, residents, businesses, and local municipalities as possible to create a plan that truly had county-wide support. New methods for engaging the public were used which resulted in receiving input from literally thousands of residents and other stakeholders. Another goal of the update was to create a graphically interesting and highly implementable plan. The recommendations and implementation guidance are specific and provide a clear roadmap for implementation over the next ten years. The Thurston Climate Adaptation Plan used sound scientific modeling and analysis, replicable decision-support methods, and innovative public-engagement tools — including a board game, prison symposium, and pop-up library at an arts festival — to develop and promote actions to help Thurston County and the broader South Puget Sound region prepare for and adjust to climate change. Such "adaptation" actions — for municipalities, tribes, businesses, households, and other stakeholders - will improve the community's hazard resilience and social, economic, and environmental sustainability. The plan's vulnerability assessment incorporates University of Washington Climate Impacts Group data and analysis, which are based on climate modeling that utilizes emissions scenarios used by the Intergovernmental Panel on Climate Change (IPCC). Thurston Regional Planning Council used the information to create maps that show historical and projected changes in climate indicators (precipitation, streamflow, runoff, snowpack, etc.) across South Puget Sound watersheds. The vulnerability assessment also describes how the region's human health and welfare, as well as highways, municipal water systems, forests, estuaries, and other built and natural "assets" within Thurston County are vulnerable to the collective impacts of natural hazards (e.g., wildfires, landslides, floods) and human-caused stressors (e.g., water pollution) exacerbated by climate change. The project team (composed of Thurston Regional Planning Council and Thurston County staff) and its Stakeholder Advisory Committee (composed of public- and private-sector representatives) adapted a U.S. EPA methodology to evaluate how 85 risks identified in the vulnerability assessment affect the community's ability to achieve 12 key sustainability goals. The project team and stakeholder committee then incorporated significant public input to develop and prioritize 91 adaptation actions that respond to climate risks of highest likelihood and consequence of occurrence. Just over a decade ago, Osceola County decided to change its direction from a bedroom community to a self-sustaining community. A series of innovative smart growth plans were put into place. These have included the re-planning of some of the largest greenfield areas (over 70,000 acres) and the Deseret Ranch property (300,000 acres) as well as one of the largest redevelopment plans in the nation, W192 (15 miles between Disney and Kissimmee, generating 8 million dollars of TIF financing a year), a new transportation plan which resulted in a new mobility fee, BRT and a new commuter rail system, code language (neighborhoods, transit oriented development, land uses, signage, etc.) and the repositioning of over 30 commercial centers to represent the new trends in retail. The Osceola Strategy for a Sustainable Future plan uses indicators and metrics designed to measure existing plans and gauge their effectiveness. The Plan was written and adopted in 2017 to illustrate a benchmark of existing conditions and to identify the effectiveness of planning policy to improve economic, environmental, social and balanced fiscal sustainability. In November of 2017, this plan was influential in the County Commissioner's decision to mandate a six-month single-family housing moratorium. The plan specifically addresses the issues with housing affordability in Osceola County due to the abundance of residents who work for Disney World (Orange County) and live in Osceola County. The plan stresses the need for an intense mix of land uses versus the existing homogeneity of land uses in non-mixed-use areas. While housing is a key issue identified in the document, the plan approach of identifying the interconnected nature of sustainable factors related to housing. For example, if the supply of affordable housing increases then the local jobs to housing ratio becomes more balanced and you reduce the number of residents commuting. If neighborhood connectivity is improved then you reduce the cost of community services, etc. Overall, the plan provides an easy to understand targeted benchmark of Osceola's current state and the plans in place to improve sustainability Countywide. The indicators can be measured at different intervals to identify progress and to help identify policy performance. The Chatham County Comprehensive Plan was created to be forward thinking in preparation for managing rapid growth all the while, supporting its rural character. It examined the existing growth as well as the impacts of anticipated large development projects such as Chatham Park proposed 7,000+ acre development in the Pittsboro's Extraterritorial Jurisdiction and the unfolding of two certified mega sites outside of Siler City and Moncure. The Comprehensive Plan's development process started in fall of 2015 when the County contracted with the consulting firm Land Design, to work with staff and regularly meet with a steering committee appointed by the Board of Commissioners. The steering committee consisted of representatives from 12 specialized local advisory boards, committees, and commissions and met regularly throughout the process to guide the different elements, discuss the framework of the plan, and provide input on recommendations and priorities for the County. Simultaneous and critical to the development process, there was also an extensive effort to engage residents. Being located in the center of the state, the County has divided news sources. Staff and the consultants gathered meaningful feedback in a variety of ways to ensure participation for all. During the development of the plan, two social media accounts, an interactive website, a meeting in a box tool, and three surveys were created to gather further detailed input. Staff and the consultants met with numerous stakeholders and focus groups, as well as presented to communities, interest groups, and coordinated info booths at local events. Additionally, in June of 2016 and February of 2017, 6 public input meetings were heavily advertised for residents and business owners to attend throughout the entire county. In March of 2017, staff coordinated and presented the final recommendations to numerous groups at their regular meetings. The Plan was presented to the Board of Commissioners in August of 2017 and thoroughly vetted by the Planning Board in the Fall of 2017, resulting in widespread support and Board of Commissioners adoption of the plan on November 20, 2017. The Transylvania County Comprehensive Plan Plan was produced in-house following an extensive two-year collaborative planning process involving the Transylvania County Board of Commissioners, Transylvania County Planning Board, Transylvania County Planning Department and over 60 volunteers or "community advocates" representing a broad spectrum of individuals, community organizations, religious institutions, economic and business interests, and many different geographical areas of the County. Public participation was significant and involved over 30 community meetings and events, social media campaigns, and a widely distributed survey; all of which together represented input from approximately 10% of the County's population. The Planning Board and Staff hosted a kick-off community event with over 100 citizens participating where the video "Transylvania County 2025 Comprehensive Plan" was screened and public participation began. The video was developed to reach the computer savvy and millennial populations. At the end of the meeting, participants identified priorities that Staff used to create two word clouds that visually communicated community concerns in subsequent documents and outreach. In addition to using the priorities identified through the public input process, the 2016 American Planning Association (APA) principles found in Sustaining Places: Best Practices for Comprehensive Plans were also incorporated into the Plan. Although the County was not one of the pilot jurisdictions used by APA to create the sustaining places principles, the County went beyond the traditional comprehensive plan that focuses on land use and physical development to create a more modern plan by engaging the community and addressing resilience, health, equity, quality of life and plan implementation. Staff collected baseline data on the current conditions for land use, economic trends, natural resources, population, housing and community services. The data was portrayed in narrative, images and maps to help the Planning Board, Board of Commissioners and the public access and interpret the information. The resulting Plan, unanimously approved by the Planning Board and subsequently the Board of Commissioners, synthesized diverse community feedback into narrative and action steps that intentionally represents the County's many different needs and values. The County Planning Division of the American Planning Association and the National Association of County Planners (an affiliate of the National Association of Counties) presented their first annual "Excellence in County Planning" awards in 2010. The Kittitas County Board of Commissioners (BOCC) and Lodging Tax Advisory Committee (LTAC) developed a tourism infrastructure plan and strategy for investing lodging tax revenues in tourist supportive infrastructure using a comprehensive mapping of county assets, an innovative method of surveying residents and visitors, and a performance based strategic action plan for maximizing its marketing and promotion results. The Kittitas County Tourism Infrastructure Plan is based on a geo-tourism definition and approach whereby the geographical character of a place - its environment, culture, aesthetics, heritage, and the wellbeing of its residents – is sustained and enhanced. Sacramento County is one of the pioneering regions in the nation to have successfully introduced health through "Active Design" into a comprehensive array of building and planning policies, most notably the updated zoning code. On July 22, 2015 the Sacramento County Board of Supervisors adopted a new zoning code and design guidelines that include an Active Design icon highlighting design guidelines that advance physical activity and health, along with an appendix training document on how to implement active design and the relationship to preventative healthcare strategies and chronic disease reduction. Active Design applies these 4 tenets: 1. Walkable and bikeable streets for connectivity and accessibility; 2. Mixed land uses with walkable destinations; 3. Increased landscape and urban forest; and 4. Safety. All of these elements also implement climate resiliency. Adoption and codifying of Active Design and health in this manner is extremely innovative especially for a county, and has not broadly been done nationally. It also brings together Planning and Health in new and replicable ways, and creates new prevention measures for County Public Health Officers. Of particular import is all the active design health work was done by a volunteer cross-sector collaborative health team called Design 4 Active Sacramento (D4AS) formed in 2013, in collaboration with the County. D4AS is comprised of professional experts that include: land use planning, transportation engineering and design, public health, private sector healthcare and community advocacy. D4AS members volunteered over two years of their time to do this important work in order to transform the future built environments into healthier communities. D4AS continues to work with the county, region, state and nationally to advance active and healthy communities. This is a small area plan in a burgeoning activity center near Smith Mountain Lake in rural Franklin County. The plan harnessed a grant award from the Virginia Department of Transportation to create a multi-modal, environmentally sensitive and economically viable vision for the area, complete with recommended zoning revisions to implement traditional neighborhood design (TND) principles that codify this vision. An important part of the project methodology was intensive multi-year collaboration with a citizen action committee who designed their own vision document that serves as the foundation for this plan. Of particular interest, the Westlake – Hales Ford Area Plan citizenry is increasingly composed of retired, but still highly active seniors. As a result, the Plan has a focus on senior livability, and the public input that guided the work was heavily influenced by this community. The end result of this senior focus is a plan that promotes mixed land uses, transportation infrastructure conducive to walking, biking and shorter vehicular trips and development patterns that serve multiple generations of Franklin County residents and visitors. An Award of Excellence went to Kenton County, Kentucky, in the Comprehensive Plan – Large Jurisdiction category for their Direction 2030: Your Voice. Your Choice. The planning commission adopted the community's first comprehensive plan in 1972 and incorporated updates every five years thereafter per Kentucky law. The combined 26.2-pound, 12.5-inch-thick behemoth influenced decisions until the Great Recession established its 'New Normal.' Planners developed its replacement — Direction 2030: Your Voice. Your Choice. — through an aggressive three-year public engagement process. That process accomplished what many thought previously would be impossible: to build consensus among all 126 elected officials and 20 planning commission members. They grounded the plan in research provided by a national market analyst, most of it from sources bankers use for reviewing development-financing strategies. This established the plan as a unique resource for near-term development proposals and a baseline for state-mandated five-year updates. Stakeholders played a critical role in crafting a number of its innovative policies. Their opposition to broad recommendations prompted planners to divide the County into four subareas — urban, first‐ring suburb, suburban, and rural — to reflect the community's diversity. Policies are based now on the differing lifestyles found across these subareas. They advocated for an easy-to-use final product. Planners responded with an online comprehensive plan (direction2030.org) that documents the plan's creation, delivers guidance to anyone anywhere 24/7/365, and incorporates GIS technologies to invite users to interact with its contents. An Award of Excellence to Kane County, Illinois, in the Best Practices category for the Kane County Planning Cooperative. The Kane County Board has utilized a "health in all policies" approach to planning since the adoption of the Kane County 2040 Plan and the launch of the Kane County Planning Cooperative (KCPC) in 2012. The KCPC's implementation strategy, which is based on integrating Kane County's Health, Transportation and Development Department planning efforts, has been ongoing and has had recent success in implementing the Kane County 2040 Plan. The overarching theme of the 2040 Plan — Healthy People, Healthy Living and Healthy Communities — provides a unified vision for the County as they strive to achieve their primary goal of having the healthiest residents in Illinois by the year 2030. An Award of Excellence to Adams County, Colorado, in the Comprehensive Plan — Large Jurisdiction category for the Open Space, Parks and Trails Master Plan. The plan for Adams County provides a vision that was lacking for the County to address tremendous changes that have occurred as urbanization has rapidly spread to rural areas. The Master Plan update provided the opportunity to be forward thinking about the parks, trails and recreation needs of residents for the next ten years, and propose a new role of open space to serve as a garden for a metropolis. The strategies provided within the Master Plan chart a course to preserve natural resources, address issues of food production and preservation of local agriculture, and include opportunities for residents to experience the outdoors in natural settings. This plan strikes a balance between the multitude of urban and rural community values and adapts the open space and parks program to the present and future needs of the changing population. An Award of Excellence to Montgomery County, Maryland, in the Planning Project category for the Pike & Rose project. Pike & Rose is a 24-acre community located a quarter mile from the White Flint Metro station in North Bethesda, Maryland. This mixed-use development replaces the outdated, 1960s Mid-Pike Plaza and, in doing so, is significant to the planning field in being one of the nation's first projects to transform a functioning strip retail center and acres of surface parking into a vibrant, walkable neighborhood. Pike & Rose is a place designed to attract a convergence of lifestyles in order to make suburban living more interesting and exciting. The planned 3.5 million square feet of offices, housing, restaurants, retail and amenities are designed to serve diverse constituencies within the metropolitan Washington, DC area. An Award of Merit to Westchester County, New York, in the Best Practices category for the Westchester 2025 Comprehensive Plan Base Studies Program. As part of Westchester 2025: Plan Together, the County's long-range land use planning initiative, the Westchester County Department of Planning created a new program to facilitate the preparation of municipal comprehensive plans in the County. This tool assembles maps, charts, figures and analysis, in the form of web-based data sets representing the "base studies" that planners have always used to draft comprehensive plans. The project is a shared services program that saves municipalities money and facilitates community planning. An Award of Merit to Montgomery County, Pennsylvania, in the Comprehensive Plan — Large Jurisdiction category for the Montgomery County Comprehensive Plan, Montco 2040. The Montgomery County Comprehensive Plan, Montco 2040, shaped around three major themes: connected communities, sustainable places, and vibrant economy, was developed through a dynamic and innovative two-year community planning process. Plan implementation guidance for the initial year was developed as part of the plan adoption. Montco 2040 will be implemented in a variety of ways. Many goals will be implemented directly by the County, but many will also be implemented by the County's partners, such as local municipalities, PennDOT, the Turnpike Commission, SEPTA and other government agencies. On April 27, 2014 at the County Planning Division's Annual Business Meeting, conducted at the APA National Conference in Atlanta, the County Planning Division in conjunction with the National Association of County Planners will present their 2014 Project Awards. This year one award will be presented, an Award of Excellence. An Award of Excellence to Larimer County, Colorado, in the Grass Roots Initiative category for Our Lands — Our Future Recreation & Conservation Choices for Northern Colorado. For the first time in Colorado, all of the local governments in a county engaged in a comprehensive study on land conservation and nature-based recreation to evaluate successes, potential improvements, and existing gaps. The Our Lands — Our Future Recreation & Conservation Choices for Northern Colorado regional conservation study used extensive public outreach, an interactive GIS website, and dedicated engagement by nine partner agencies to produce a plan that shapes the vision of open space conservation in the county. A systematic effort was made to link the project to other important regional objectives, including demonstrating the vital role land conservation places in contributing to quality of life, maintaining agricultural production, and enhancing the region's ability to attract new businesses and maintain those that are already in place. 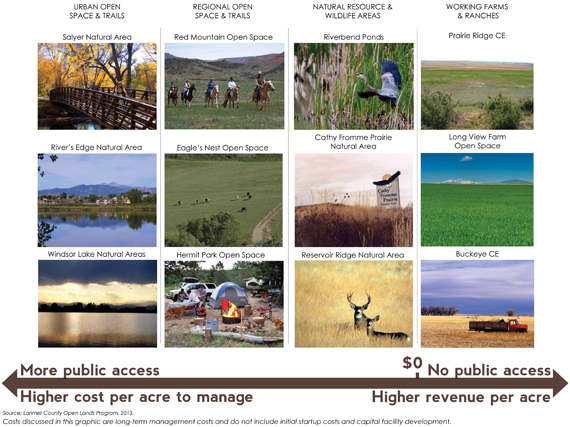 The combined county-wide and jurisdictional-specific needs assessment, opportunity maps, financial models, and citizen priorities in Our Lands — Our Future Recreation & Conservation Choices for Northern Colorado will help conservation partners and public land managers ensure that investments are strategic, cost-effective, and representative of community values. On April 14, 2013, at the County Planning Division's Annual Business Meeting, conducted at the APA National Conference in Chicago, the County Planning Division in conjunction with the National Association of County Planners will present their 2013 Project Awards. This year six awards will be presented: three Awards of Excellence and three Awards of Merit. An Award of Excellence to The Hillsborough County City-County Planning Commission, Florida, in the Best Practices category for the Guide to Creating & Updating Community Plans in Unincorporated Hillsborough County. The Guide crystallizes the rational, roles, process, and structure of newly created community plans and plan updates in urban, suburban and rural contexts. Planning staff and community use of the Guide is intended to enhance the effectiveness of community plans in shaping ... distinct, vibrant and lasting communities. An Award of Excellence to Clark County, Washington, in the Special Focus Planning Initiative — Senior Livability category for the Aging Readiness Plan. Affordable and appropriate housing, supportive community features and services, and transportation options help create places where everyone has the opportunity to live independently and participate in civic and social life as they age. The Clark County Aging Readiness Plan assesses the county's readiness to serve as a home for a growing number of older residents. The plan is divided into five elements: healthy communities, housing, transportation/mobility, supportive services and community engagement. Each element identifies challenges residents may face as they grow older and lists strategies to overcome them. An Award of Excellence to Howard County, Maryland, in the Small Area/Special Area Planning category for the Downtown Columbia Plan. The Downtown Columbia Plan is a 30-year master plan for evolving Columbia's suburban oriented Town Center into a socially, economically and environmentally sustainable urban community. Following an extensive planning and community engagement process, the Howard County Council approved the Downtown Columbia Plan on February 1, 2010, and readopted it in the County's July 20, 2012, general plan update. The Downtown Columbia Plan will guide the mixed-use development of over 13 million feet of retail, commercial, residential, hotel and cultural development. An Award of Merit to McHenry County, Illinois, in the Best Practices category for the Green Infrastructure Plan. The McHenry County Green Infrastructure Plan is the result of a comprehensive planning effort to identify, promote, protect, and enhance McHenry County's green infrastructure resource areas. It was developed with contributions of natural resource and land management experts, municipalities, townships, park districts, and local citizens. The plan features the first countywide green infrastructure map and offers numerous recommendations for implementation at the regional, community, and neighborhood scale. An Award of Merit to Sarasota County, Florida, in the Planning Project category for Nathan Benderson Park. Nathan Benderson Park is located in unincorporated Sarasota County. This county park used by a handful of local fishermen was once an unimproved borrow pit lake originally created to serve road construction needs in the region. Today, it's being transformed into a 600-acre regional park that includes a world-class rowing venue with the potential to attract international visitors to Sarasota County, while still serving the local community. An Award of Merit to Richland County, South Carolina, in the Grass Roots Initiative category for the 8th Annual Neighborhood Planning Conference. The Richland County Council and the Planning and Development Services Department has made it a priority to address the struggling nature of urban communities and rural neighborhoods throughout the County and created the Neighborhood Improvement Program to address those challenges head-on. "The Neighborhood Planning Conference" emerged from this effort as a grassroots level conference that extends beyond the traditional scope of planning, broadens public understanding of the planning process, provides neighborhood outreach initiatives and fulfills unique educational programs designed for special populations. The 8th Annual Neighborhood Planning Conference provided an unparalleled service to over 200 participants. On April 15, 2012, at the County Planning Division's Business Meeting, conducted at the APA National Conference in Los Angeles, the County Planning Division in conjunction with the National Association of County Planners presented their 2012 Project Awards. This year three awards were presented, two Awards of Excellence and one Award of Merit. An Award of Excellence was presented to Charlotte — Mecklenburg County, North Carolina, in the Small Area/Special Area Planning category for their Elizabeth Area Plan. The Elizabeth Area Plan was developed over an 18-month period and included a thorough analysis of the opportunities, challenges, goals, and vision for the community. It provides succinct direction for land use, transportation, community design, infrastructure and public facilities, and environmental policies through the use of text, maps, and graphics. A stakeholder group was integral in the development of the plan document and provided thorough review and comment on the draft plan. Their comments were addressed by staff in the final document adopted on November 14, 2011. An Award of Excellence was presented to Montgomery County, Pennsylvania, in the Best Practices category for their Model Ordinance Series. The Model Ordinance Series provides a comprehensive and easy to use set of tools for the County and its municipalities to foster sound land use development. The publications provide the user with an explanation of the pertinent land use issues to be addressed by each model. Also a clear description of design elements that should be incorporated to address the topic of each model ordinance is described through numerous photographs and illustrations. The layout of each model ordinance document makes it easy to understand the purpose of various standards and criteria used in the model and how to modify them to better meet any local concerns. Effective aerial photographic illustrations clearly depict suitable locations for types of land uses and how individual development projects can be designed to achieve overall community goals. Various forms of computer simulated site design are used to illustrate key design concepts within each model. An Award of Merit was presented to Westchester County, New York, in the Best Practices category for their Homeseeker Website. The Homeseeker Website provides a straightforward comprehensive tool for outreach to broad communities and diverse populations and to provide information that makes it easy for potential "homeseekers" to take advantage of the homeownership and rental affordable housing opportunities offered in the County. With the click of a mouse, visitors discover a wealth of information about the homes, the neighborhoods, financial eligibility requirements, affiliated housing resources and counseling agencies, and can view the housing site they select in Bing maps to experience a virtual satellite-view tour of the very community they are considering moving into. On April 10, 2011, at the County Planning Division's Business Meeting conducted at the APA National Conference in Boston, the County Planning Division in conjunction with the National Association of County Planners presented their 2011 Project Awards. This year three awards were presented, one Award of Excellence and two Awards of Merit. The Award of Excellence was presented to Charlotte – Mecklenburg County, North Carolina in the Small Area/Special Area Planning category for their Area Plan Implementation Program. The Area Plan Implementation Program is a system created to inventory, analyze, track, and implement capital projects as well as other recommendations originating from adopted Area Plans. It began from the need to follow-through on the community's planning vision that was developed during a lengthy and in-depth planning process. The program established annual bond funding for area plan capital project implementation, enhanced information sharing amongst public service providers, and has resulted in the construction of a number of projects. The Awards of Merit were presented to Henrico County, Virginia, in the Grass Roots Initiative category for their Homeowner's Enhancement Guide and to Riley County, Kansas, in the Best Practices category for their Vision 2025 – A Comprehensive Plan for Riley County, Kansas. The Homeowner's Enhancement Guide is intended as a means of maintaining the stability and desirability of mature neighborhoods. The Homeowner's Enhancement Guide is a how-to handbook intended for homeowners and prospective purchasers of older homes, which may be in need of modernization and enhancement. The Guide is a tool for homeowners and prospective purchasers of mature homes that assist in the processes of adding character, modernizing, and improving livability through improvements at various ranges of cost. The Vision 2025 – A Comprehensive Plan for Riley County, Kansas provides the guidance to ensure the continued viability of the agricultural sector within the county while allowing compatible residential growth in appropriate areas. Developed over a 20-month time span by a representative steering committee with the guidance of facilitators and staff, the plan includes unique features such as a statement of property rights principles, an exclusive agricultural district, a uniquely tailored Land Evaluation Site Assessment System and an innovative Surrounding Agricultural Land Easement to protect agricultural operators. Gwinnett County, located in the greater Atlanta area, was recognized for a very ambitious and detailed 2030 Unified Plan that incorporates excellent data and implementation steps to address a variety of issues that this high-growth area currently faces. The awards committee was particularly impressed with the scope of the project, as well as the outreach efforts including the website. Nancy Lovingood, manager of long-range planning for the county, accepted the award along with project consultant Holiday Collins Storck from PB Placemaking, and delivered a presentation that provided additional details about the planning process and current status of the plan implementation. Gaston County, located in the growing Charlotte metro area, was recognized for a Unified Development Ordinance that was established through an inclusive process involving a wide variety of stakeholders. The awards committee was impressed with the county's effort to move ahead, while retaining history and character through creative implementation of planning principles and public participation. David Williams, the Gaston County Planning Director, accepted the award and said the expectations for the project were high. "We were charged to "raise the bar" by enhancing development standards to promote quality development, livability, consistency with other existing policies while protecting our tax base." The Mountain Landscapes Initiative, a project managed by the Southwestern Commission and consulting firm The Lawrence Group, developed a detailed reference guide for local governments, officials, citizens, and developers to improve development practices in six rural counties located in western North Carolina. The project was recognized for its extensive public engagement process and transferability to other rural areas. Judy Francis, County Planning Division Chair-Elect, accepted the award on behalf of the Southwestern Commission and the Lawrence Group, and commented that "creative land use planning is not just a function of the metropolis. Some of the best work being done throughout the country is in rural areas that have never undertaken comprehensive planning before, but are now concerned about the impacts of inappropriate development on dearly loved landscapes."